To have a successful food truck business, you need to efficiently systemize a variety of processes, know your numbers, and have a great team. But even if you have all that down, there’s one thing that can make or break you on the streets: food truck design. Let’s explore your design options, analyze the costs and benefits, and see some real-life examples that are killing it. Wrapping your food truck in professionally printed vinyl is the most stunning and crisp looking option. These wraps tend to be eye-catching and captivating, thanks to the ability to use bright colors and complex designs. The vinyl is also laminated, which protects the coloring from weathering and washing out from UV-rays. Generally, you can expect your vinyl to last between three and five years. This option, however, can end up being pretty expensive. Most vinyl wrapping companies charge between $2,500 and $5,000 for this service, but many of them include the design and installation services as a part of this fee. But when you consider the vibrancy of the colors and lifespan, if you can afford to spend the money, do it. If you’re looking to save money but still have vinyl wrapping, you may be able to negotiate a lower price by having the design created by a third party, rather than the vinyl wrapping company. If you decide to go this route, we suggest using 99Designs, a design contest site, to have your wrapping professionally designed for somewhere between $300 and $800. They even have a pre-vetted section devoted entirely to car and truck wraps, which ensures you’re not hiring a designer who’s never done this before. It’s also possible to only use a partial wrap that covers the bottom half of your truck, for example. Then you can use paint to finish off the upper half. We never suggest trying to install the wrap yourself. Sure, it may save you money, but you’re bound to make mistakes that’ll result in weird bubbles, wrinkles, or poorly cut areas. Always let the pro do this part. Vinyl wrapping occurs in three main steps, all of which can take a total of one to four weeks, depending on the availability of the wrapping company you’re working with. Creation of the design — Give your logo and design preferences to your design agency or wrap company and they’ll create a few wrap design options for you to choose from. Production and printing — Your complete wrap is professionally printed on large commercial vinyl printers and laminated to add an extra layer of protection. Wrap installation — An experience wrap installer attaches the wrap to your truck, carefully cutting when necessary to make the design flow into vehicle elements like windows, fenders, and rivets. In the end, you have a visually stunning food truck that’s sure to impress and attract customers. 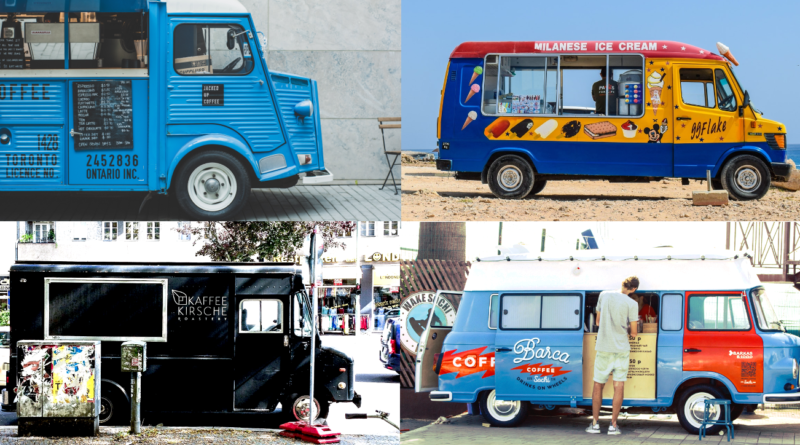 Few food trucks choose to use paint to brand their rig, but it can be an economical option for getting started on a smaller budget. Even when using strong outdoor paint, you can expect to pay half of what it would take for a vinyl wrap—that is, if you’re a good painter yourself. However, if you’re not so good with a paintbrush, you may want to hire a mural artist. While this can increase your expenses by $500 to $5,000 (thus, eliminating the financial benefits of going with paint), it does offer the ability to give your truck a hands-on artisan feel. Done right, painted trucks can be just as stunning and attractive, but, frankly, that’s much harder to achieve and long-term maintenance is often a bigger struggle. How Bad Is A Bad Paint Job? If you’re really trying to be frugal with startup costs, the appeal of painting the truck yourself is completely understandable. But you must be careful—poor paint jobs can cost you serious business. Chris Kaye, the owner of The Atacolypse Food Truck in Erie, Pennsylvania, says that his low-budget paint job was hurting his business—but it wasn’t clear until he bit the bullet and added a vinyl wrap to his truck. I went and had it wrapped and we immediately doubled our followers (on Facebook). He also says calls about partnerships and events significantly increased after the wrap was installed, which led to a big boost in business overall. Possibly the most photographed food truck on the internet, The Rocket’s stunning view into the wood-fire stove and kitchen doesn’t require a colorful wrap to capture your attention. The contrast between big truck and picturesque pizza kitchen gets the job done well enough. Sushi. You can tell from a mile away. It’s cute, looks well put together, and simple enough on the outside to be affordable. While the featured cuisine of this truck is clearly communicated, it’s not terribly in-your-face. The contrast between the lower and upper sections highlights the logo and demonstrates an effective way to use a half-wrap and still look professional. The color scheme is perfectly evocative of a classic PB&J sandwich, but the design goes further to specify what makes the business different with words like “fresh nut butter” and “local jam”. You know it’s making you curious about how good a PB&J can actually be. 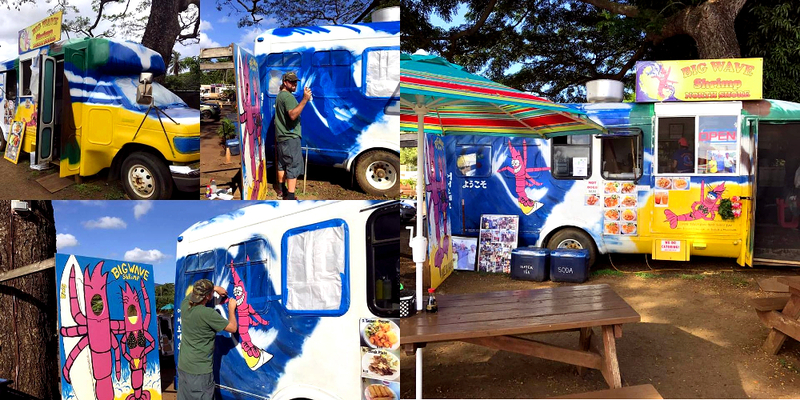 This hand-painted truck doesn’t look as crisp or clean as the other vinyl examples, but it still feels appropriate for a Hawaii-based truck. It’s a strong example of how the handmade visual mood can really vibe with the target customer. Now here’s some clear marketing: “yummy Japanese food on the go”. There’s absolutely nothing to interpret from the design or language—the cuisine is clear as day. And not to mention it just feels unassuming and fun. The vinyl clearly indicates some style of Asian cuisine, and the logo seals the deal by clarifying the primary offering is a bao bun, a Chinese BBQ bread roll. Try driving next to this one and not looking over at least three times. The logo and contact info are clearly visible on multiple sides of the truck. And that red checkered pattern—it’s unmistakable as the classic Italian tablecloth. It’s simple, yet striking. 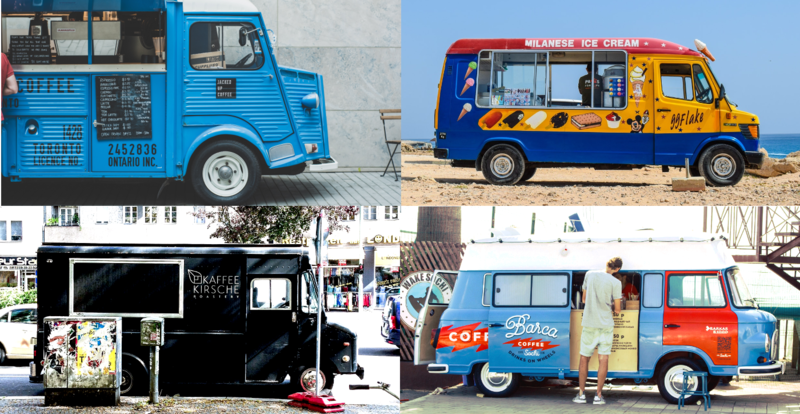 Designing a truck that attracts customers is just the beginning of establishing an efficient, profitable food truck business. To ensure sure your customers have a great time once you’re up and running, you also need to carefully design your customer experience. Engage with customers, offer loyalty rewards, and facilitate a smooth ordering process with POSBistro, the point of sale platform we’ve created specifically with food trucks in mind.